This is a premium quality, 50% cotton 50% polyester, machine washable, long sleeve unisex jumper which is hand made to order. We use the finest quality clothing vinyl to create a vibrant print which will not crack or fade like other methods such as screen printing and transfer printing. We have used our years of experience to provide you with a high quality product which will not be matched at this price point. Available in ages 3-4, 5-6, 7-8. 9-11, 12-13. This design is also available on women’s fitted t-shirts, children’s t-shirts, children’s and unisex adult hoodies, unisex t-shirts and baby vests. Please click HippoWarehouse to browse all our items. 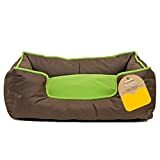 A cosy bed in a funky colourway with the added benefit of a durable outer fabric thats coated on the inside to stop urine and water reaching the polyester filling. Designed for small to medium rabbits, guinea pigs and ferrets. Measurements: 41cm x 33cm x 11cm.